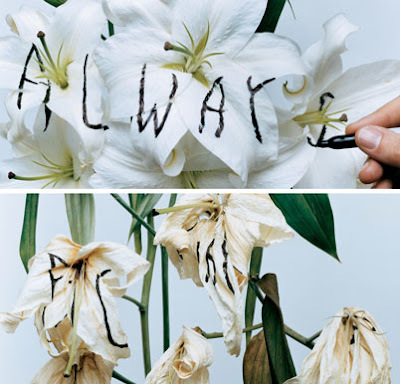 Bela Borsodi (photography) + Stefan Sagmeister (art direction) from The Drawbridge. Is this a grim series to post on a wedding blog? I dig it. I think it will remind me not to fixate. To appreciate the ephemeral things while they last. My mom just sent me this Stefan Sagmeister video, with a bunch more of his conceptual art. My favorite piece is: "Complaining is silly. Either act or forget." casablanca lilies, my favorite bloom! it's not sad, it's just life. i dig it too! This is great! I always like watching flowers go through the wilting process, but I guess I'm weird like that.